The Khovd River flows for over 500km from the Altai Mountains on the Mongolian-Russian border to Khar-Us Lake. Matt and Jamie get their first taste of wild water packrafting by descending a section of the Khovd starting in Olgii, the capital of Western Mongolia. 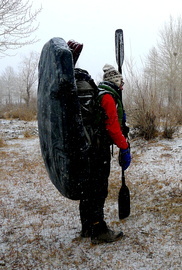 They soon find how the fast approaching winter and their lack of paddling experience combine together to make a deeply memorable jaunt in the wilderness.